What to do with all of the bits and pieces of fabric left over from previous projects? Why, stitch them together to make a new patchwork piece of fabric! 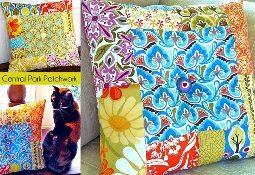 And then use that patchwork fabric to make a pretty throw pillow. Sew4Home has the tutorial. Go there now.